1. Preheat oven to 375°. Heat large skillet over medium-high heat. Add bacon and cook 4 to 5 minutes or until crisp, stirring frequently. Add onion and cook 3 to 4 minutes or until onion begins to soften, stirring frequently. Add garlic and cook 1 minute, stirring frequently. Add butter and tarragon, and cook 1 minute or until butter is melted. Stir in spinach and cook 1 to 2 minutes or until spinach is wilted. Remove skillet from heat, and stir in cream cheese, breadcrumbs, lemon juice, 1/4 teaspoon salt and 1/4 teaspoon pepper. Transfer spinach mixture to shallow dish and refrigerate 30 minutes. 2. To butterfly beef, cut beef lengthwise down center, but do not cut all the way through, leaving 1/2 inch uncut. Open beef and lay flat between plastic wrap on cutting board. With flat end of meat mallet, pound beef to flatten to 1/2-inch thickness. Remove plastic wrap, and evenly spread spinach mixture over beef, leaving about 1-1/2-inch border around edges. Starting at one side, roll up beef and filling to form a pinwheel. With kitchen string, tie beef crosswise at about 2-inch intervals. Tie beef lengthwise with second piece of string, threading through crosswise ties. 3. Heat large skillet over medium-high heat. Sprinkle beef with remaining 3/4 teaspoon salt and 1/2 teaspoon pepper. Add oil to skillet and sear beef 1 minute on each side or until outside is browned. Place beef on rimmed baking pan and roast 35 to 40 minutes or until internal temperature reaches 135° for medium-rare. Let beef stand 10 minutes before removing string and slicing. 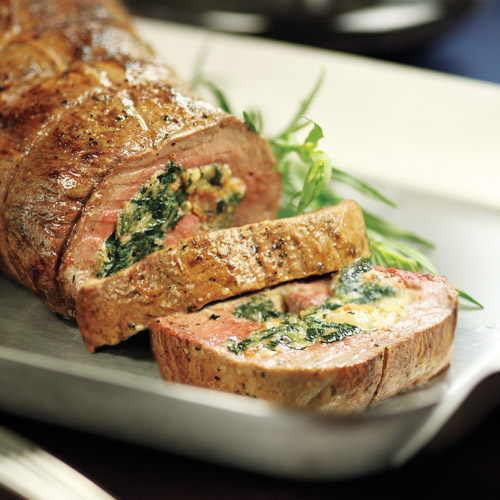 Spinach filling can be made up to 1 day in advance and refrigerated. Remove from refrigerator 30 minutes before using.